So, I'm from Illinois, remember? Growing up, the biggest fruit picking thing we ever did was apple picking in the fall, and maybe a first grade school field trip to the pumpkin patch, which was really only exciting because we all got to wear jeans instead of our school uniforms and could count on Capri Sun juice packs in our brown bag lunches. Because of my limited childhood fruit picking experiences, it never ceases to blow my mind that I'm raising a child in California--not only can we pick apples and pumpkins in the fall, but crazy things that I only ever ate on rare occasions as a kid, and strictly from the supermarket. Strawberries! Blackberries! Citrus! Kiwi fruit, for crying out loud! All for the public picking at little farms tucked away up and down the coast. Unreal! California kids don't know how good they've got it. You take them strawberry picking, and they slam your sofa into your front window and bust a whole section of it. These kids, I tell ya. Oh, yes! Didn't I tell you? Little C totally shattered the front window. It was epic. The sort of thing that makes a mother curl up in her closet with a bowl of Strawberry Sour Cream Ice Cream and a bottle of Wild Turkey. Or something. I wish I could tell you that this past week has been glorious, not a snag in the plan. Full of strawberry ice cream, baskets of puppies and rainbows. Really, I wish I could tell you that. But then my kid went careening through the house for the one millionth time despite my protests, tripped fabulously across the rug, fell into the sofa (very good for the kid), and shoved the corner of it backwards into our huge front window (very bad for the window). As my pulse was recovering from the slams and the shatters, checking my wombfruit's limbs for breaks and lacerations, surveying the entire scene for wayward glass, the cat walks in. Our new-ish cat who has deemed himself an outdoor cat and spends most of his days doing God-knows-what all around town. Only this mysterious outing left him limping in pain across the kitchen floor, one back foot mangled and bleeding ten minutes before dinnertime, and two minutes after my kid scared the pajamas out of me and totally busted our front window. It was a cherry of an evening after that, that's all I'll say. Well, that, and it all ended up being very, very expensive, and now our front window has a Klassy sheet of cardboard affixed to it with about half a roll of packing tape and our cat is on painkillers and wearing a plastic cone on his head, which is about the saddest thing you ever did see. Now what does all this have to do with Strawberry Sour Cream Ice Cream? Nothing. Absolutely nothing. I just needed to vent about some first world problems. Also, the strawberry picking trip that preceded the creation of this ice cream was the last good thing we did as a family before the whole thing went to hell in a handbasket. 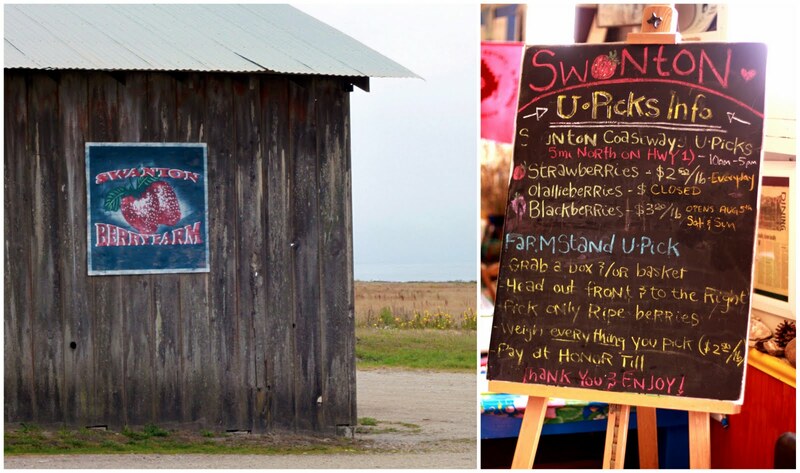 If you live in the Bay Area and have the lovely sort of children who don't bust your windows and you want to do something really, really great to reward them, may I recommend a trip to Swanton Berry Farm? Because this day was just completely perfect. We set out early in the day, grabbed breakfast on the way down the coast, and arrived at the farm late morning. It was so rustic and charming, a world away from the city. We paced up and down the long beds of plants like strawberry-seeking missles, keen eyes out for flashes of red fruit among the green leaves. Within minutes, Little C was suuuper into it. Like, In. To. It. Lots of running and shouting and seeking out the ripest berries. I must say, the kid has a real future as a berry picker. Which is great, because she'll need a way to pay us back for busting the front window. After we put away two of the farm's devastastingly perfect berry shortcakes (hoooo-man, youdon'tevenunderstandsogood), we drove back up the coast for an early seafood dinner before heading home to pass out. It was basically the ultimate family day, the stuff that you think about doing pre-kids and are all idealistic: "Oh, I'll totally do this with my kids, and THIS and this and thiiis...", before you even had any idea of what you'd be up against. Which is to say, it was a really great day, the stuff parental dreams are made of. The next day I did the most logical thing when one is faced with a whole flat of ripe berries, and the answer is not jam, my friends. The answer is strawberry ice cream, and preferably this one, with a tart swirl of sour cream in the mix. It is dead simple, and so perfect right now, as the last strawberries of the season can be found. Do it! Before all hell breaks loose in your house, too. A splash of booze with almost any fruit makes it irresistibly juicy and makes the flavor really burst, so don't leave it out. Don't even think of using light or lowfat sour cream--it will make for an icy, non-creamy ice cream. This ice cream is best soon after its churned, and not firmly frozen like other ice creams. In a large bowl, toss together the berries, sugar and liquor. Let sit at room temperature for at least 1 hour, stirring occasionally. In the bowl of a food processor, combine the berry mixture, sour cream, heavy cream and lemon juice. Pulse until mostly smooth with some remaining chunky bits for texture. Refrigerate the batter for at least 1 hour. Transfer to an ice cream maker and freeze according to the manufacturer's instructions. This ice cream is best soon after it's churned, and not frozen solid.